Today, we continue our series on investing in Fine Wines by presenting to you a man whose nose literally moves the Market, Robert Parker. Enjoy! Robert McDowell Parker Jr. is the world’s most influential wine critic. Born in Baltimore, Maryland (USA) on July 23rd, 1947, he continues to guide the fine wine industry with the tip of his nose, still going strong at the age of 66. Robert M. Parker Jr. is undoubtedly the world’s most renowned wine critic. Since the late 70’s Robert Parker has been a prominent figure in the world of fine wine; his publication ‘The Wine Advocate’, an independent wine consumer guide, first published in 1979 draws a following of at least 50,000 subscribers to date. Ever since the relatively new market of fine wine investment has taken off, wine connoisseurs, financial experts and investment brokers have been paying close attention to Robert Parker’s ‘million dollar nose’. Robert Parker Jr. – the Million Dollar Nose due to the fact that Parker’s ratings have been known to significantly affect the value of wines and cause severe price fluctuations in the market, any investor in the fine wine industry should be well aware of Robert Parker’s opinions. Robert Parker introduced his own wine rating system because he felt that critics often undervalued or overestimated a fine wine, mainly due to conflict of interest, for example the critic having a financial interest in the wine they are rating. Additionally, Parker felt that the commonly used 20-point system did not offer enough flexibility, and often resulted in unjustified, misaligned ratings. Therefore, Robert Parker’s 50-100 point quality scale (referred to as ‘Parker Points’) offers a widely accepted industry standard by which to gauge fine wine quality. An extraordinary wine of profound and complex character displaying all the attributes expected of a classic wine of its variety. Wines of this calibre are worth a special effort to find, purchase, and consume. A barely above average to very good wine displaying various degrees of finesse and flavour as well as character with no noticeable flaws. A below average wine containing noticeable deficiencies, such as excessive acidity and/or tannin, an absence of flavour, or possibly dirty aromas or flavours. Does your nose have a special talent? Let us know about it here! Naturally, if you are interested in learning more about Fine Wine Investing, please email us. The following is a synopsis of the Bordeaux region and the sub regions which are responsible for producing much of what the world today considers a fine wine. The following will both demystify the wines of this region and whet one’s appetite for a taste test of their own! Red Bordeaux (or “Claret” as the British have always known it) can be the epitome of fine wine. The best wines exhibit a wonderful complexity of aromas and flavours, great elegance and refinement and an ability to age gracefully – some for a hundred years. Like all of France, quality wine production in Bordeaux is governed by a set of regulations known as “Appellation Contrôlée”, often abbreviated to “AC”. An AC covers a certain geographical district and governs production of wine within the district. The whole of the Bordeaux region is covered by a couple of catch-all, generic ACs: AC Bordeaux and AC Bordeaux Supérieur (the latter is higher in alcohol, but not necessarily better). An enormous quantity of inexpensive, “everyday” wine is made under these ACs. Though this is not the “great” Claret that all the fuss is about, it can provide very attractive, reliable drinking. There are also many smaller, named areas, each entitled to its own AC: AC Fronsac, or AC Pomerol for example. These more specific ACs are usually superior to generic Bordeaux and have stricter regulations. To the west of the river Gironde, the vineyards of the Médoc and Graves are based on gravelly soil and are planted mainly with Cabernet Sauvignon vines. To the east lie Pomerol and St-Emilion, two smaller areas of predominantly clay soil, planted with a higher proportion of Merlot. Hence we have “left bank” and “right bank” wines. The wines from each area can have quite a different character because of the different soils and predominant grape variety. This also means that one is usually more successful than the other in any given year. This region is dominated by large wine-making estates, known as châteaux. Whilst many of these do indeed have a château as their HQ, others have nothing more than the vineyards and a collection of ordinary working buildings. Unlike many producers from other parts of the world, each château tends to produce only one “grand vin” which carries its name. Some of them also make a white wine, and many make a second wine, from vats not considered good enough for the “grand vin”. St-Estèphe wines are structured, tannic, long-lasting, “masculine” wines. In 1855 Médoc wines were classified. From the many thousands of wines produced in the area, just sixty were thought worthy of classification. These sixty were sorted into five ranks or, in French, “Crus” (meaning “growths”), i.e. “Premier Cru” (first growth), “Deuxième Cru” (second growth) and so on. All classed growth wines command very high prices, many of these, particularly the Premiers Crus, are bought by investors all across the world. To this day the classification remains more-or-less unchanged and many of the original classified châteaux are still producing some of the world’s greatest wines. Of course strong arguments could be made for promotions and relegations within the classification. A group of wines known as the “super seconds” are generally acknowledged to be Premiers Crus in all but name, and a few of the original châteaux have either gone or have lost their reputation. However, apart from some obvious anomalies, it is remarkable how the bulk of the classification holds up, even after 150 years. Just below these classed growth superstars of Bordeaux are a host of wines known as the “Crus Bourgeois”. Many fine wines can be found within this classification – some are worthy of classed growth status, yet are available at a fraction of the price. I have found properties such as Chasse-Spleen, Meyney, Coufran and d’Angludet to be consistently good. However, in 2006 a court case found that the classification of the Crus Bourgeois was illegal, and pending a restructuring which means wines will have to be independently assessed for inclusion each vintage, the whole classification was temporarily suspended. Graves lies to the south of the city of Bordeaux. This region produces both red and dry white wines on the very gravelly soils after which the region is named. The red wines tend to express a soft, earthy quality. Like the Médoc this region was also classified, but not until 1959. Only a couple of dozen châteaux are entitled to the words “Grand Cru” on their label. The best vineyard sites of the Graves are clustered in the North of the region. That is where almost all the Grands Crus are situated. In 1987, this area was given a brand new AC of its very own: Pessac-Léognan. Wines bearing these words on their label should be of higher quality than most Graves. The undoubted super-star of the area is Château Haut-Brion. As noted earlier, this property was actually declared a Premier Cru in the 1855 classification of the Médoc due to its exceptional quality. Uniquely, it is allowed to have both classifications on its label: Médoc Premier Cru and Graves Grand Cru. Its sister property, La Mission Haut-Brion, is also capable of the highest quality. St-Emilion Premier Grand Cru Classé “A”. Pomerol is by far the smallest of the great regions. It has 2 basic constituents that determine the character of its wines: the soil is thick, heavy clay and one grape variety dominates: Merlot. Pomerol wines are extremely soft, seductive and full of spice and vivid fruit. The production tends to be tiny in the area, so the wines are generally expensive. Indeed, Pomerol is home to some of the world’s most expensive wines such as Châteaux Pétrus and Le Pin, the latter producing little more than 500 cases each year. You will rarely see these wines in shops as they are snapped up years in advance of production. Look for more reasonably priced wines such as Petit-Village, Le Bon Pasteur and Clos René. The wines of Pomerol have never been classified. The Bordeaux area also produces world class white wines, though invariably in tiny quantities. The most famous of these are the sweet wines of Sauternes and Barsac, including the almost legendary Château d’Yquem. These luscious wines (also classified in 1855) are created by a particular and unpredictable fungus, called botrytis. Botrytis rots the grapes, leaving them high in sugar and glycerine which leads to their eventual silky, honeyed sweetness. The best dry white wines come from the Graves area. Though often of tremendous quality, these tend to be scarce and the famous names are very expensive. From the inexpensive, soft, fruity and delicious wines of the Premières Côtes de Blaye in the north of the Bordeaux region, to the moderately-priced structured, tannic and impressive clarets of Fronsac or Lalande de Pomerol, the “lesser” red wines of Bordeaux are not to be despised. Whilst the finesse and breeding of the top classed growths might be missing, the red wines of the region are generally very reliable and well made. The dry whites of the region, from areas like Entre-Deux-Mers or simple AC Bordeaux can produce refreshing, zippy, occasionally slightly tart wines for drinking young. 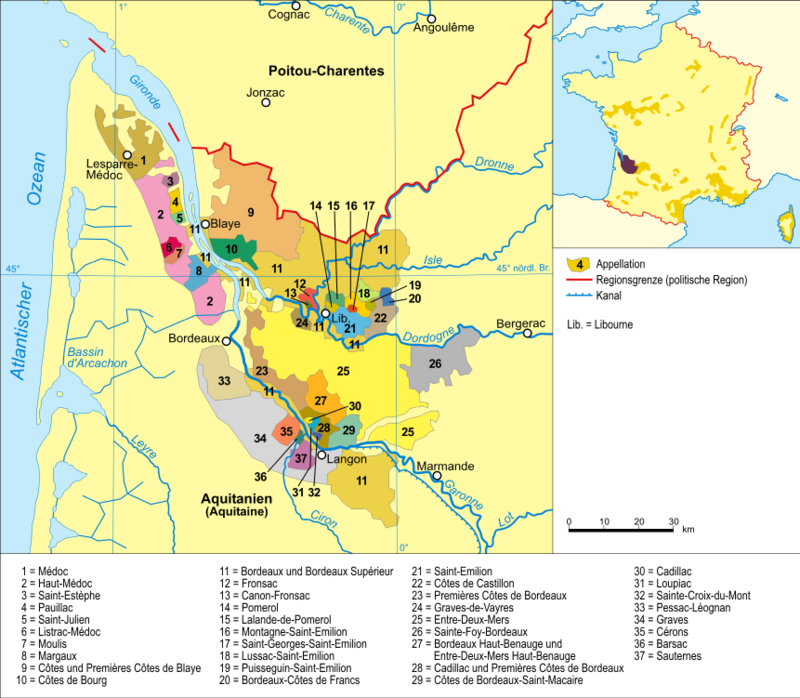 Areas around Sauternes, like Sainte-Croix-du-Mont or Loupiac which lie just across the Gironde, also produce sweet, sometimes botrytis affected wines that can be very good and are moderately priced. Rosé is also produced in the Bordeaux region, often from the Cabernet Sauvignon. It can be delicious stuff with bright, supple fruit and refreshing acidity. Indeed, the Bordeaux Region and its Appellations are the epicenter of the production of Fine Wines today as they have been for over 150 years. A basic understanding of the region and the wines that are produced there, which we hope you have gained by reading the above information, is absolutely crucial for anyone who wishes to dabble in fine wine for investment purposes or blow a large chunk of change on an excellent bottle of wine, which is a sort of investment in its own right. If you would like more information on fine wine investments, simply email us at: halfwayfoods@gmail.com with the word “VINO” in the subject line. More to come on the Fine Wine Market. Until then, Bon Appetit!